The school holiday program involves teams of volunteers running activities for the children of the Mowanjum community during each school holiday with assistance from adults within the community. The Boab Network combines with other programs with similar goals of supporting our young people in order to deliver the best school holiday programs possible. The activities are aimed to keep the young people in the community engaged during times when fewer organised activities are available to them. The programs aim to provide informal education, role modelling, friendship and the teaching of important skills. Attempts are made to provide opportunities for the children-youth to visit Perth and their traditional country. Opened in 2010 and expanded in 2012, the Community Resource Centre is funded through Royalties for Regions. It gives the people of Mowanjum access to 22 computers, 11 iPads, internet access and opportunity to purchase second hand laptop computers. The CRC enables the people to develop skills that make the outside world more accessible. It provides a place for meetings and training with projection facilities and Westlink TV service. It is a safe place in the community for children and youth with the support of Manager, Lorel Holmes. Lorel also collects Mowanjum’s mail and distributes it from the CRC. There is a dedicated Centrelink phone, printer and computer providing free access to Government and Banking websites. 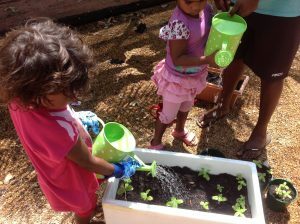 In 2014, the Boab Network renovated an old ‘donga’ and established the Early Parently and Learning Centre with funding from the Department of Prime Minister and Cabinet to employ, Gail Cresswell a qualified Montessori teacher. All such funding ceased in 2015. Fortunately Gail was appointed by the Education Department to run the nearby Mowanjum’s Pre- Year 1 School in the Community. 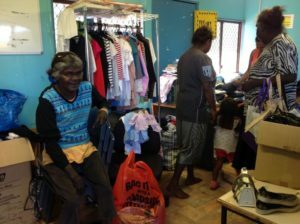 The Op Shop gives the Mowanjum people access to inexpensive clothing and household goods. Led by Claire Smith, donated merchandise is collected and freighted up from Perth by Boab Network volunteers to stock the shop. Lost property is collected from HBF Stadium and Beatty Park Aquatic Centre for the Op Shop. The Op Shop is managed by members of the Community with assistance of Losana Mar, the wife of the Uniting Church Minister, Rev. Jo Mar. The Boab Network developed the business plan that enabled Mowanjum Aboriginal Corporation to raise funds for yards, bores, fencing and a breeding herd so the pastoral station operational for beef production and create employment and training opportunities for the community. A further business plan enabled MAC to install a centre pivot irrigation system for fattening beef cattle during the 8 month dry-season. The Boab Network school holiday program usually involves a visit to the pastoral station to enable the young people to envision a future in the pastoral industry developing skills in fencing, welding, horse and cattle management. The Boab Network recognises the fact that the people of the Mowanjum Community suffer from very high rates of chronic diseases related to diet and lifestyle issues. These ongoing health issues affect their social, cultural and economic wellbeing and quality of life. School holiday programs aim to include activities promoting healthy lifestyle messages and to model good lifestyle choices, recognising the fact that lifelong habits can be best established in childhood. Through their holiday programs the Boab Network also works collaboratively with other community groups to reinforce “healthy living” messages. Boab Network volunteers assist, when asked, to prepare grant applications and to advise on matters of governance to instrumentalities of the Mowanjum community. They are also actively involved in supporting Mowanjum folk who may be visiting Perth for medical or other appointments. They assist with the annual cultural festival and running of the Arts and Cultural Centre.